Breaking things down into their component parts and analyzing them comes very naturally to me. I happen see things in structures and, usually, with some impartiality. Art, on the other hand, is very challenging for me. While I have a certain very broad sense of what might be considered not very good and what might be considered very good, even those assumptions are wrong maybe 20% of the time. There is also a context to art; the history, the movement of ideas and experiments, what has come before. I am not unread in this regard, but the subtleties frequently elude me as does the answer to the question, “But why would anybody do that?” Jackson Pollock and cigarette butts on canvas falls into that category. What I wonder is this: is the art world rigorous? If we were to craft a survey, asking recognized art experts to explain the reasons certain pieces of art cross the boundary into “art,” would they agree? More interesting still, if we had these experts analyze a number of unknown works, would they agree on which were worthy? However, there is a flaw in that study, by definition “unknown” means either undiscovered or not noteworthy. The art world is constantly encountering works at its lowest end and making decisions as to which get elevated to higher and higher degrees of regard. 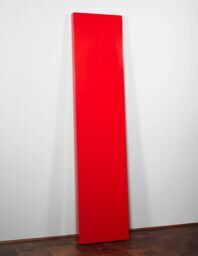 “Red Plank’s” artist somehow made it from garage to art festival to small galleries to large museums through a filtering process. Other artists who initially displayed with John McCracken may still be showing their art at neighborhood events. To conclude, I have no sense for this (or for music or for wine, for that matter) but I wonder if anybody else does either, really. I would like to see a rigorous standard applied and I would like to see how the art on the periphery does when held to that standard. I do believe that everything is quantifiable, even if subjectively (e.g. take a poll of art critic, list their reasons, etc.). It might even be useful to run a study to discover the list of criteria to poll on (e.g. originality, quality of execution, importance within an artistic movement, place in art history, brilliance of vision, aesthetics, etc.). It would also be interesting to run a study of how the experts line up versus the public. Is there a gap between the professional and the amateur? Where are the fault lines? I suppose too it would be interesting to track art’s valuation (not price but the rating of its artistic merits) over time to see if art follows a fad-like pattern or a more informed sorting algorithm. Less Art in the Classroom! In my view there is too darned much art coming out of kindergarten and 1st grade. Ok, I am sort of kidding but what I mean is that, as parents, we receive a blizzard of art. It’s too much to honor or use in a meaningful way. As a parent volunteer, I find myself in a mad rush to get the students to complete the artwork before the station/center ends. They get rushed and have no fun and the quality of the art suffers, all to make sure more art is produced. Anybody else see a problem here? I am not sure where the mad rush to create disposable art comes from. It is easier, I suppose, to make disposable art than to work with the kids on truly meaningful art. And, true, quantity seems to beat quality for many Americans. However, in my classroom I will try to only do meaningful exercises, art or otherwise. I think teaching quality by taking the time to do art “right” is a far better lesson for the students than, what, churning out high volumes of low quality art? Really, what is the benefit of rushing through one (or two) pieces of art a day? Working for two, three, or more days on one fine piece of art is the same amount of art practice as the same hours spent on disposable art. Yes, for me, art will be “practice” work, identified as such and with a particular intent in mind (e.g. cutting), and periodic “peak” pieces that take multiple days and represent accomplishments and even artistic statements of which the students and their parents can be deservedly proud. Here’s to less (disposable) art in the classroom!